A whole baked turkey is one of the traditional Christmas dishes. 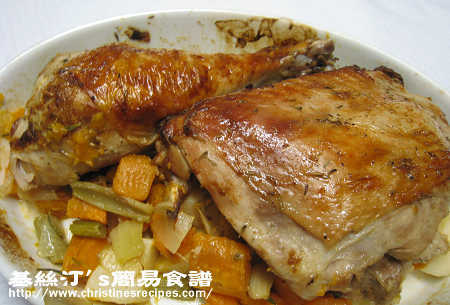 What a sensational enjoyment it would be when tasting the tender turkey meat going with some favourite salad. It’s quite challenging to bake a whole turkey evenly with moist meat inside without burnt outside anyway. So before gathering guts to bake a whole bird, I tried to experiment with a turkey leg. The dish turned out really wonderful and more delicious than I thought. The turkey meat was tender enough, going really well with the delicious mushroom gravy. Best of all, this dish costs a few dollars, guaranteed with 100% success rate. I love eating turkey not only in festive seasons, but also at anytime I think of it. Here’s the dish that I used a turkey leg with thigh that weighted 1.6 kg, enough to feed my whole family of three. My daughter dressed up the salmon salad for us. Yum…. I guess I would bake it again when the warm Christmas comes down under in two weeks’ time as this dish would take shorter baking time without heating up my kitchen too much. Cut away the thigh from the leg at joint with a sharp knife. Squeeze lemon juice and rub evenly on turkey. Sprinkle 1 teaspoon of salt, freshly grated black pepper and dried thyme leaf, rub over the surface of turkey. Heat 2 tablespoons of butter in a skillet until melted. Cook onion over medium-low heat until softened. Add celery, sweet potato, potato. Sprinkle about 1/4 teaspoon of salt, combine well and cook for a while. Add rosemary, pour white wine. When it just boils, transfer to a baking tray in a single layer, top with marinated turkey, cover with a greased foil. Bake for 1 hour. 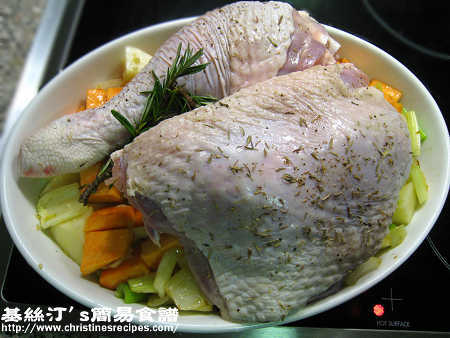 Remove foil, continue to cook for another 20 to 30 minutes, or until turkey is tender. Test the turkey with a fork or needle, if juices run clear, it’s cooked through. Remove from oven. Carefully drain out sauce from tray and sift out excess oil. Let turkey rest about 10 minutes before cutting. 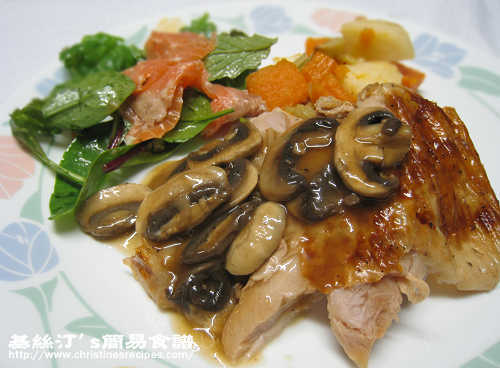 Cook gravy for turkey: melt 1 tablespoon of butter and sauté the sliced mushrooms until softened. Pour in sifted sauce and 1/2 cup of water or chicken stock. Bring it to a boil. Slow heat and simmer until the sauce thickens, about 8 to 10 minutes. Add thickening and cook to your preference. Carve turkey and serve with salad or any vegetables you like. Ladle mushroom gravy on top of turkey. Wow, look at that turkey. They're so juicy and scrumptious. And the mushroom sauce makes it even more tempting. This looks like a great meal! The mushroom gravy sounds terrific! I can see the turkey leg looks so juicy and tender. I love the mushroom sauce too. I have not baked a turkey yet....too big a challenge for me. I always bake turkey drumsticks at home. Haven't seen a while turkey leg here. Maybe I should bake each one a turkey drmstick this year...haha. The mushroom sauce here looks really delicious. What a great idea for folks that may not be able to have an entire turkey. We do whole turkeys here and this looks like a great way to mix it up with other traditional ways of cooking it. Great idea to make a turkey leg and it looks delicious with mushroom gravy! I love the mushroom gravy recipe you posted! I can never get gravy right - it is always hit and miss - yours looks foolproof! I will be baking a turkey this year. Unsure whether my rangehood will be in on time so did not order any. It is hard to keep a turkey moist and tender but it seems like you made it work here. Good job. Oh my father who adores his turkey legs would be so happy if I made this. Grand idea and the mushroom gravy is mouth-watering. It looks sooo delicious, great idea serving with the mushroom sauce! Agreed on using turkey year-round. All the stores were selling turkeys on super-sale after Thanksgiving, so it's a great opportunity to stock up. The meat can be very delicious when it's cooked with the ideal method, and you definitely picked a winner with this dish! If I use smaller drumsticks (about 1 lb each) how should I adjust the cooking time? Thanks! It depends on how big your dish ends up. Normally, bake for 50 mins to 1 hr if 1.5 kg in total amount. Just insert a needle into the thickest part of the drumsticks. If clear liquid runs out, it's cooked.